What makes the modal move.. Following on from last week there are two key issues that have been part of the process. Borrowing from the theory of change I initially used in StreetSpace, Transparent Operations and Real Relationships have been key. 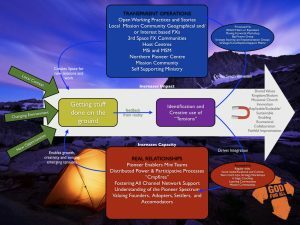 So whilst I have a lovely but ridiculously complicated diagram about why and how transparency and relationship function to increase capacity and impact its not rocket science. Indeed operating Transparently and fostering Real Relationships have always been key for sodal organisations but finding the right feedback loops and processes to the modal is key if we want the the modal to take care of itself. Sodal is always about journeying into the cultural and community, about going further and deeper and making sure the stories from the frontier are fed back. Its about foresting good relationships so those stories are recognised, inspire and take root in the modal so encouraging people to give stuff a go. I wonder if there is an argument to say that when sodal side of missional church pushes out that the modal takes care of itself. For full definitions see Ralph De Winters paper but for shorthand I borrow from Jonny Baker “modal is the local gathered and sodal the spread out focused around a mission task” I think that maybe when you do the sodal well the modal gets a jump start as well, we have seen a proliferation of Fresh Expressions of church in Cumbria close to the fringe of the established church. Many have been great, imaginative, relational and for those involved bold and brave steps, but they aren’t what I would have done, and thats okay. When I arrived in Cumbria I deliberately set up 3rd space Fresh Expressions which were more akin to the emerging church stuff I was familiar with, they were not connected to the local churches so they had space to play and work towards the right hand side of the pioneer spectrum. They included Maranantha Yoga and Mountain Pilgrims and so Ive heard it said “i’m not going to do anything as mad as Richard but I’ll give this a go…” Subsequently we have seen a modal move to action, engage their fringe really well, and yes its not what I would do but thats more than ok its brilliant. There has been some really quite horrid stuff flying around the web in response to Vicky Beechings book Undivided. The level of vitriol sometimes explicit and sometimes couched in religious terms was disconcerting even for someone like me who knows just how difficult Christians can be when you challenge certain orthodoxies. So much so that the only word that came to mind was “deluded”. This is not a word I use lightly but to see the Christian story and particularly details (around practices, what is and what isn’t kosher) as so fixed, so unnuanced, so unchangable, is out so out of keeping with the “educational, cultural and social background” of the Christian narrative that it seems delusional is the only word available. It is only by using the word delusional can I make any sense of some of the cheap shots (about her replacing one stage for another or she could never have been a Christian) that have been thrown Vickys way. The trajectory of Christian story is rooted in love, it starts in a garden and heads to a city, it moves in an ever unfolding redemptive arc, it didn’t start with Jesus, but he exemplified it, and it certainly didn’t stop with Jesus whose words to love our enemies call us to continue in those footsteps through the ages and continue beyond the now as what love really is, becomes uncovered. When you deny the humanity of one person, struggling, wrestling, seeking and sense making you step outside that arc, and you loose something in yourself. Why were we captivated by the kids in the cave in Thailand but not the 1000s who die crossing the Med – is it the smaller number, that they were a footie team, we’ve been caving but not fled a warzone, or its simply a good story and we are lying to ourselves that we care? I feel I need to do more, do differently, and sometimes I do and often I don’t. Each time a see a lifejacket wether on the news or canoeing in the lake, I see a Syrian child. I squash the images to survive, I glimpse moments of joy and hold my daughter close, and each time pray I wrestle. This is a kind of follow on post from the royal wedding. Millions of people would have seen Curry preach that sermon. However a quick trawl of you tube for the wedding sermon shows the three top hits of the whole 13 minute sermon were that CBS had 620k (split across two videos) BBC had 900k views. Then a few days ago Chris Pratt did the above speech which so far has 1.9m views on the MTV you tube site alone. So there are some sound bite and length things, context driven things and audience issues, but a few observations. As a piece of public speaking it for me it captured the balance of fun and points well, it was challenging in an inductive way, provoking more questions of the post christian audience than it provided answers. As I was reflecting on Pratts talk a Church Times article also popped in my news feed which suggested that even brilliant sermons like Currys would fail to draw in a significant number and I don’t think Chris Pratts style would either. Culture has shifted, if there is still a place for public speaking, thats now the podium (public square) rather than the pulpit. I know the arguments for the pulpit is that people need teaching, but the evidence is that learning is most effective when not upfront, talk driven. Perhaps the argument is exhortation, but isn’t this more effective if people shared what they had done that week and encouraged one another, built in accountability and wrestled with their own discipleship. We have to accept that the culture has shifted and stop hanging onto the pulpit like some sort of holy cow. When I grew up in the late 70s and early 80’s people friends had written off God because of science, I felt like people had written faith off and weren’t even seeking truth other than through technology and the sciences. The known and concrete was what my friends were after, growing up in family vaguely connected to church I knew what they meant, and so we didn’t really give faith much serious thought till 86. But I remember we knocked stuff around before that at school, probably a fledgling gen x’ers wondering but disillusioned. I certainly remember that having faith conversations with my peers was non existent or difficult, until the 90s when the disillusioned wonderers wanted to wonder even more and hyper modernity really kicked in as institutions became more distrusted, including the institution of science, and people recognised that perhaps there were more mysterious things that couldn’t be explained easily and everyting could be questioned and deconstructed. Now I feel I am back full circle where it’s much harder talking about faith once again, not because people aren’t seeking but because the truths they have uncovered so far about about love and life, (perhaps encountering the God who is love beyond the walls of church) don’t match up with the judgemental insistution they perceive the church to be. Recently I was trying to find a venue for this, and people were very hesitant to be involved in something perceived to be by organised religion, saying work for the church for problematic even when you see how much this event is telling a very different story. There are times when words fail me so if anyone gets what I am trying to say let me know. when i really embrace the Christ and his words I find myself caught in the paradox of a deep faith that is unshakable and enables me to play on the edge, I become confident that there is one G-d, so seekers will find, and where space is created G-d shows up. Paradoxically this unshakabilty makes me question a number of fronts, could I do more, should I do differently, and knowing the Christ that broke through the curtain, tore it two, should I do at all. And wether I am caught in the doing or being, or even when I am caught between the two I love that Christ always shows up, because Jesus has come and gone, returned and never left. When we fail to operate out of the paradoxes, we disempower and we perpetuate the myths of organised religion, we operate from positions of power, and we compromise the opportunity for indigenous faith to be nurtured and supported. My post on the royal wedding sermon prompted a fairly mixed response with many of my friends experiencing similar negative or not bothered responses. However what was really interesting for me from the comments process was how wedded the church is to particular methods, approaches and systems. It could be argued that preaching is one of the minor cultural texts that make up the wider church culture, and regardless of denomination the circuit of culture (representation, identity, production, consumption and regulation) has created a vague but impenitrible culture. If culture eats strategy for breakfast, strategy is just the muffin on the side when it comes to what church culture can consume.